Tomorrow is the day that we fly out to Thailand/Cambodia – yipee! I have packed paints, laptop and camera but have no idea whether I will be able to post or not yet as we will be a little off-piste at times. Hopefully, there will be posts of mangoes, rambutan and mangosteens in the next few weeks but we’ll have to see. If not, bear with me and I will be back on April 16th with a fresh eye and a bucket full of inspiration. If you have just found my blog (maybe we met at the CL fair), please do sign up by going to the subscribe box to the right of the blog. That way you will get my next blog automatically. It really is knowing that I have all you lovely subscribers that keeps me painting. Enjoy the sunshine that has finally found us in the UK – happy days. An exhausting but fun day at the Country Living fair – time for bed. I didn’t get to post yesterday as I had to go to Bristol. Here are some more of those doubles in an empty caper jar. I’ve been missing the wallpaper so decided to put it in this painting. Up at the Country Living Fair tomorrow so don’t forget to come and say hello (stand M43a) if you are heading that way. I will be bringing the last of the daffs with me. Very excited about upcoming trip to Cambodia and trying to work out how to fit clothes (minimal), paints, laptop, camera and boards into suitcase whilst adhering to the weight allowance. It could all come unstuck since my daughter’s very kind art teacher has donated 48 sets of watercolours (in tins!) to take to the orphanage we’ll be visiting. Something’s got to give…………I might be down to two pairs of smalls and some Travel Wash. Shudder the thought. Tomorrow is the start of the Country Living spring fair. If you’re coming then do visit stand M32 (Charlotte Supple Interiors) and say hello to Charlotte who will be displaying her usual lovely french bric-a-brac along with my paintings. If you’re going on Friday, I will be there with her and would love to say hello. Meanwhile, back in daffodiland, we’re reaching a crescendo. More of those lovely doubles. What a glorious day. The dog and I have just been taking in some rays along the lane and he picked up a branch the size of a tree (or tried to). We had words because for one thing, it would have taken the rest of the afternoon for him to drag it home and for another, it wouldn’t have got through the door. He has some big ideas for a small Jack Russell. Whoops………..that didn’t quite work did it. Happy Mother’s Day to all you mummies out there – yummy, wrinklie or otherwise. I hope you all had tea in bed. I was lucky enough to have tea and After Eights for breakfast in bed! Off to hockey again now and then home to a roast dinner care of my son……aw. 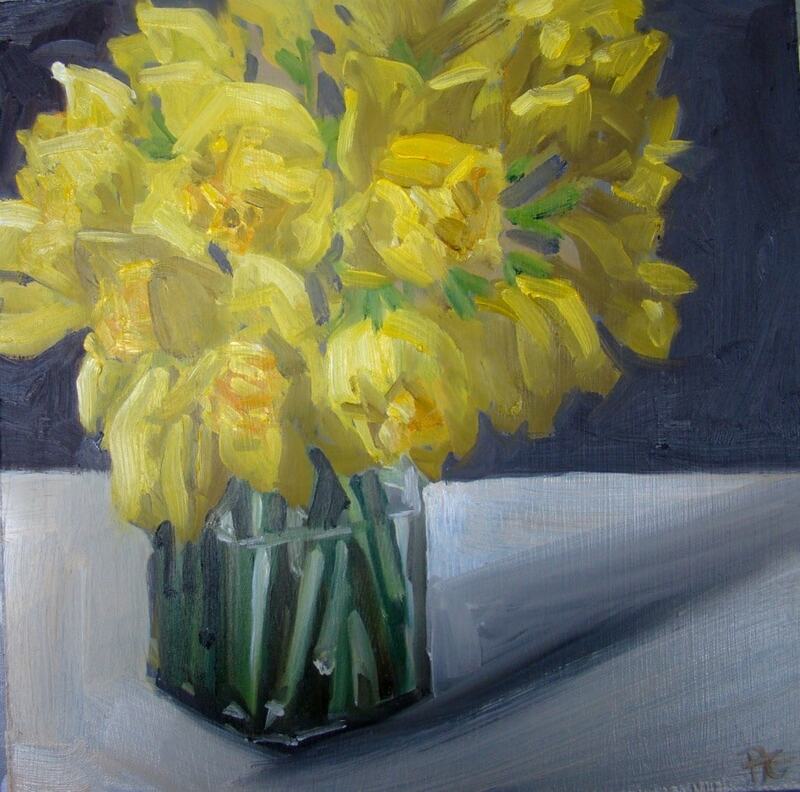 Here are some more daffodils to mark not only Mother’s Day but a spectacular Welsh win. I hope you’re not sick of daffodils – there are more to come yet! I’ve also remembered to take a photo half way through the blocking in process. When I get to Thailand and Cambodia, I hope to be painting Mangosteens, Papaya and Frangipani – that’ll make a change. Only six days to go – yipee! I’ve had a busy day today. Painting until mid-afternoon and then taking delivery of and sorting out new greetings cards which I will put on the website as soon as possible. I can’t get yellows to photograph very well, I’m not sure why. Does anyone have any tips? Ok, prepare for a daffodilathon – here is the first of many. I found this little milk jug in an antique shop in Buckingham and it spoke to me because of the tonal range it allows. So, that was the morning. The afternoon is going to be spent preparing for our upcoming return to Thailand and Cambodia in the form of rifling through drawers and cursing that extra inch that has crept onto my waistline since I last wore my summer clothes. (No smart-alec comments please). 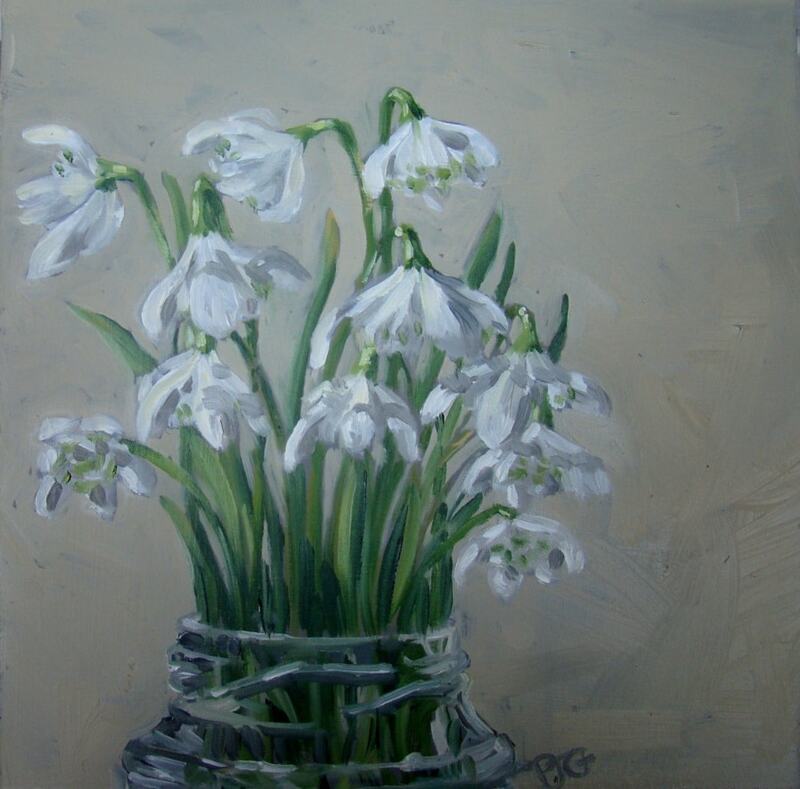 Before I start on my daffodil-fest I thought I’d post the last of the snowdrops. I didn’t get to paint today as some old friends called in which went beyond lunchtime and then I had to make a mercy dash to school to extract child, dash to shops and buy new astro trainers as soles of current incumbents apparently flopping around ten inches behind the wearer. More exciting news today. My blogger chum Haideejo Summers has nominated me for a Liebster award which is apparently for blogs that you like. How lovely and it means I get to make some nominations in turn. So, assuming you can’t duplicate, here goes. Firstly, to Neil Carroll who is a fellow-brit and paints dark and moody still lifes relentlessly. Also to Natalie Italiano who is doing a brilliant project painting wonderful teenage portraits. Lastly, to Laurie Moses who has set up a Daily Painters UK website and is also very good at imparting her knowledge. For some unknown reasons, I can’t link to Haideejo’s website but it is www.haideejo.blogspot.com and well worth a look as she is a colourist who makes you think about colour! Anyway, hopefully tomorrow will get to my white tulips which are opening at a rapid rate of knots so I could wake up in the morning to find a heap of white petals on the table.